It is April 1908. At a railway construction site near Lüderitz, German South-West Africa, the African laborer Zacharias Lewala discovers a gorgeous, shining stone in the middle of the desert. He gives it to his supervisor, German rail foreman August Stauch, who immediately recognizes the treasure that he holds in his hands: a flawless diamond. News of the discovery travels fast and in record time, entire prospector colonies develop. 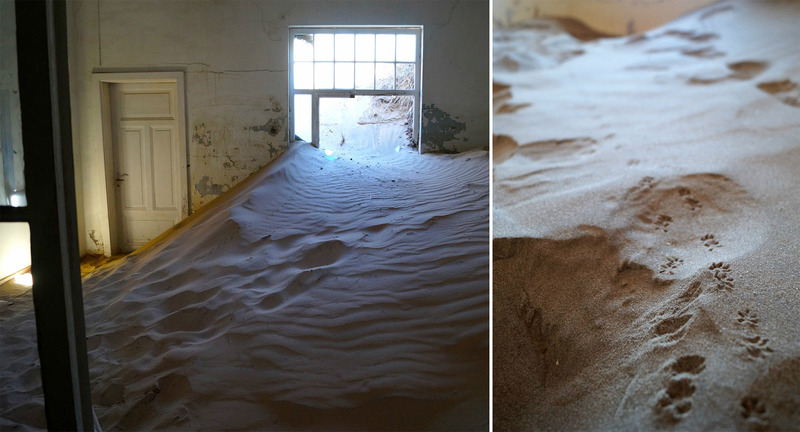 One of these is the town Kolmanskop (Kolmannskuppe), which will grow into the richest place in all of Africa. Yet this wealth does not last long. Namibia! This vast and seemingly untouched Namibia! A whole two million people in a country almost twice as large as Germany. Safari, wildlife, nature, and especially the emptiness and vastness make this country so exciting. 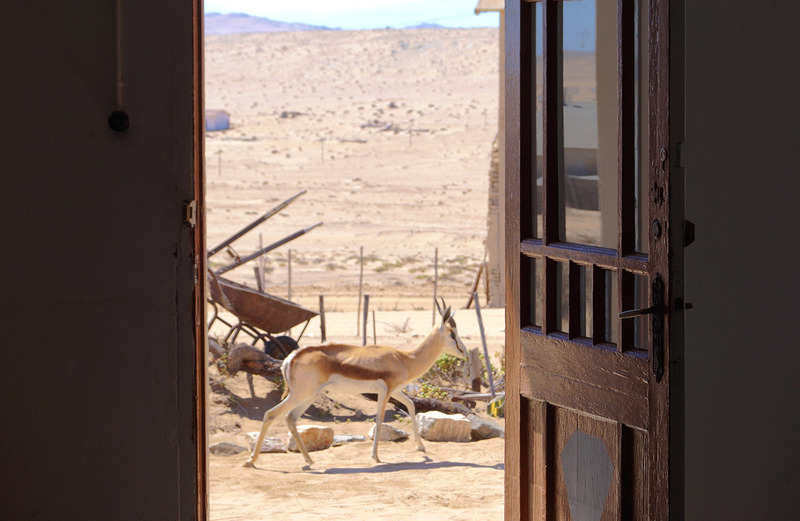 It is as if we were bouncing around on the moon for hours when we head for the legendary Kolmanskop. However, no Neil Armstrong planted his flag on this moon; the Teutonic colonial power did. Landscape in the Namibian desert. This is how I imagine the surface of the moon. 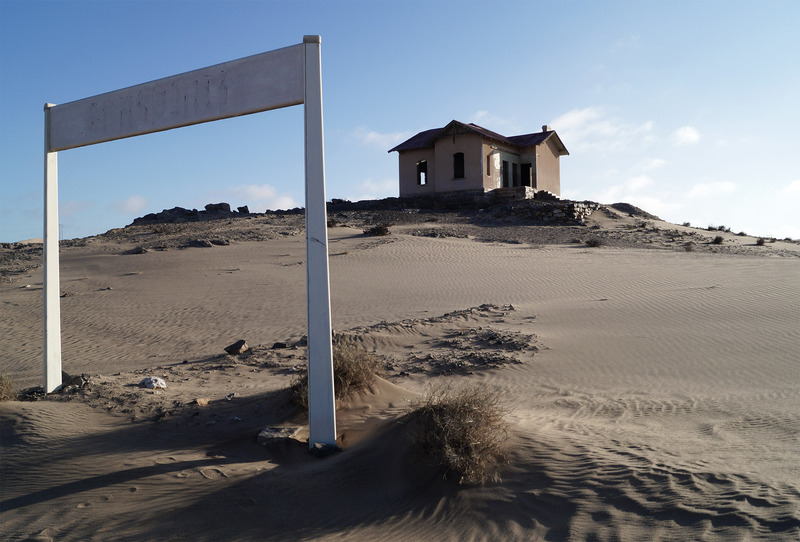 Time and time again, relics from that period can be seen in the middle of one of the most hostile deserts in the world: desolate ruins  train stations from back then. The tracks are still next to them, covered by the lashing desert sand. 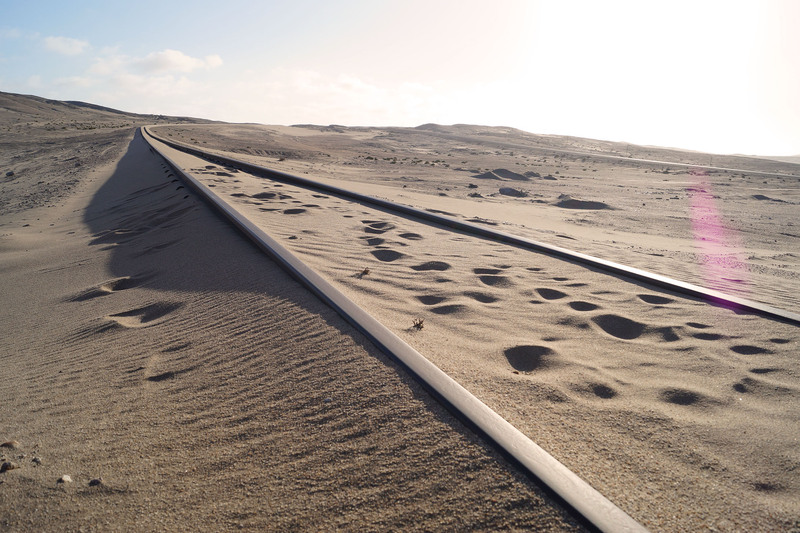 It is easy to imagine why there were special railroad workers who solely removed sand from the tracks on this stretch between the towns of Seeheim and Lüderitz. 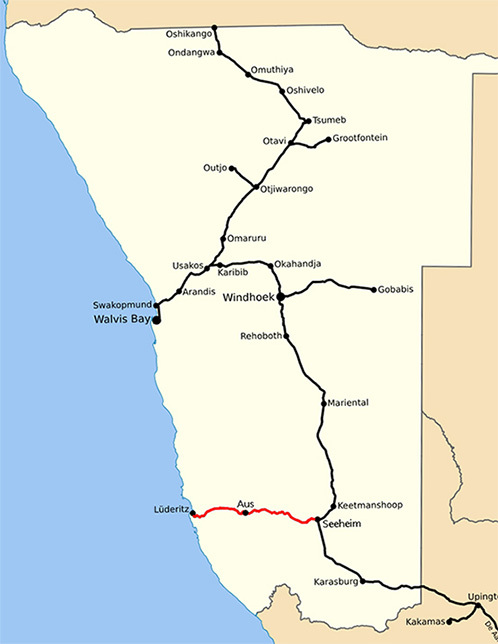 Train tracks traversing the desert between Aus and Lüderitz. This stretch was laboriously restored from 2001-2014. We pass the so-called “Grasplatz” train station. Railway employee August Stauch was transferred here when his asthma became more severe in German Thuringia. His doctor advised him to spend some time in the ideal climate found in German South-West Africa. However, it is hard to shake the feeling that the German Empire may not have meant anything good with this, as Stauch's workplace was now the Namib Desert. Besides sand, rocks, and lashing wind, there seems to be nothing here but the air you breathe and the sun that burns you. Even the name “Grasplatz” (which means “lawn” or “grass court”) is a euphemism at best (and a joke at worst), for there is certainly very little grass over here. The old Grasplatz Station. 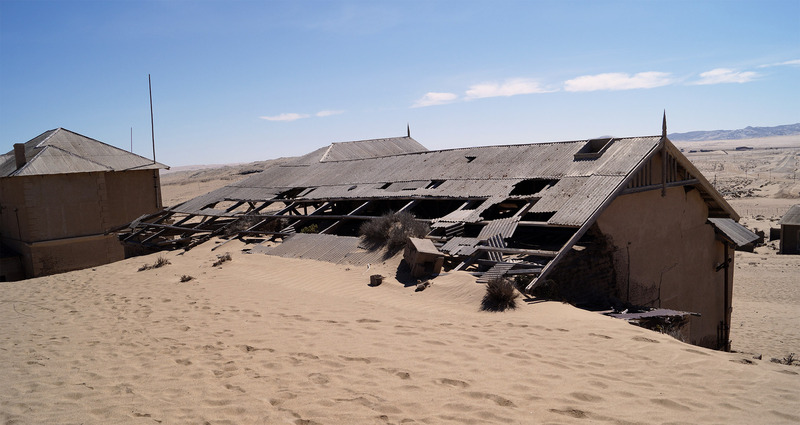 Today, the train station is a ruin in the middle of the barren, hostile Namib Desert. Another train station close by. 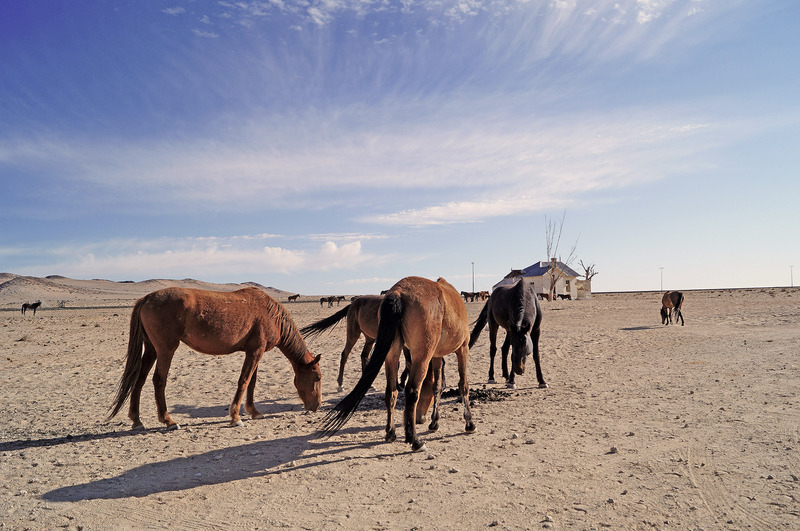 In the middle of nowhere, the only passengers to be found here are wild horses. Stauch would not have been a German functionary had he not taken a morally conscientious stance against the forces of nature and followed up on his duty  keeping a roughly 20-kilometer (12.5-mile) long section of the railway free of sand drifts. It would later pay off, as the forsaken Namib Desert had even more to offer: diamonds. Stauch quickly obtained the mining rights for more than 20,000 hectares (49,421 acres) of the desert land. But there was no real need to prospect, as diamonds could be picked up off the ground easily with bare hands. The sparkling sand of the diamond desert. 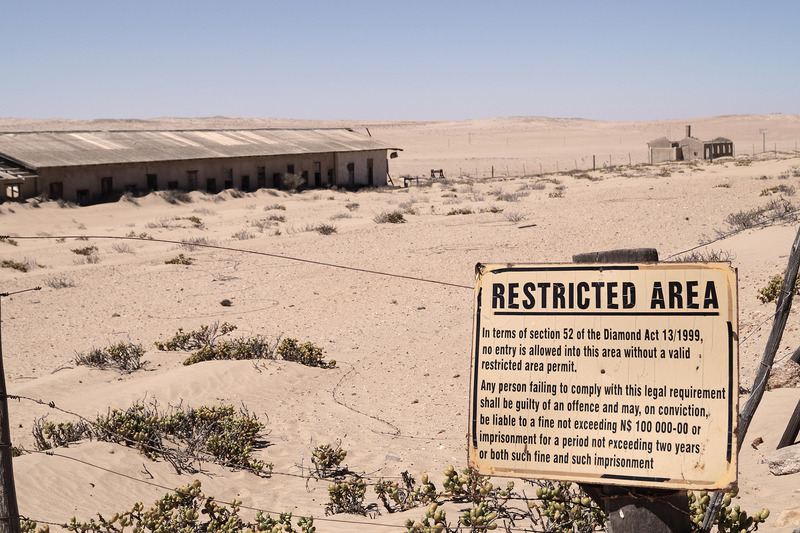 The German government, of course, became aware of these findings and quickly turned a 26,000 km2 (16,250 mi2) area along the German South-West African coast into a restricted area  the so-called “Sperrgebiet,” or “restricted area”  which it remains even today in Namibia. Anyone wishing to enter this area needs clearance. And the Namibians take that very seriously. Temptation is strong to try one’s luck on Namibian soil, especially as you can easily pass barriers, but people constantly advise you against it. 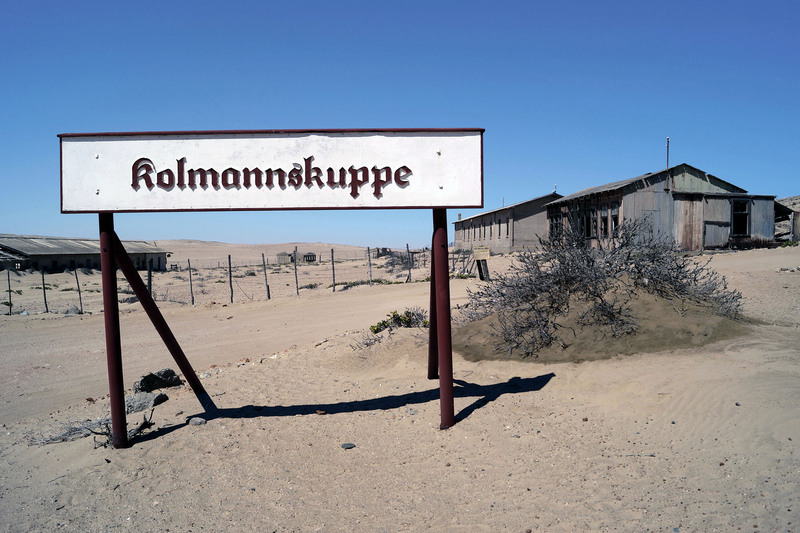 Within two years, a whole town named Kolmanskop formed near Grasplatz, with all sorts of convenience stores, a school, a hospital, the first X-ray machine in the entire southern hemisphere, an ice factory (for the operation of the first refrigerators), and exclusive German-style manor houses. A gym, a casino with a bowling alley, a saltwater swimming pool, and a ballroom were built for entertainment. There was even a light railway just for the town of Kolmanskop. It’s easy to imagine the glamorous parties that took place here. A German playground was created, in the middle of the desert, thousands of kilometers from home. The dream of some colonialists came true. Wet dreams in the dry lands. The restored bowling alley. An old punching bag also awaits you. The construction material for these extraordinarily luxurious projects came from Germany by ship. Drinking water came from South Africa. There is everything you can imagine for the time period  and much more. The town grew into the richest in all of Africa. The bodies of old cars can be seen here and there along the Namibian roads. By one of these cars near the Sperrgebiet, it says that two robbers who had stolen diamonds from the restricted mining area fled in a 1937 Hudson, chased by the police. The police caught up with them and shot them to death. Same as here, the bullet holes are still visible on that car. The diamonds, however, were never recovered. Since then, it is said that the ghosts of the thieves roam the valley when the moon is full, searching for their diamonds. So better leave your necklace at home when planning to camp in that area. Yet what is left when one of the most inhospitable regions on the planet is exploited and stripped of its only profitable resource? 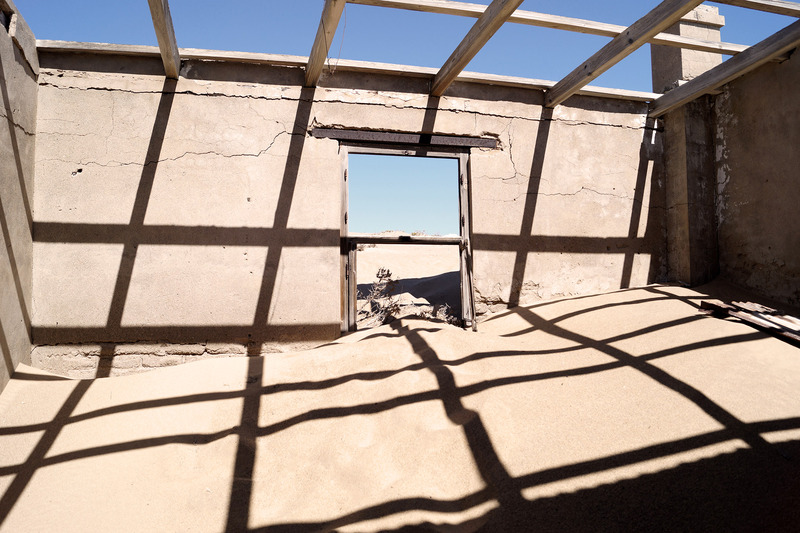 It was already so worn out by 1920 that diamond extraction was shifted ever further to the south until, ten short years later, Kolmanskop was no longer of interest to the German Empire. The desert took back its territory little by little and finally won the war. Today, all that is left is a ghost town buried in sand. The dunes measure a few meters in some areas. 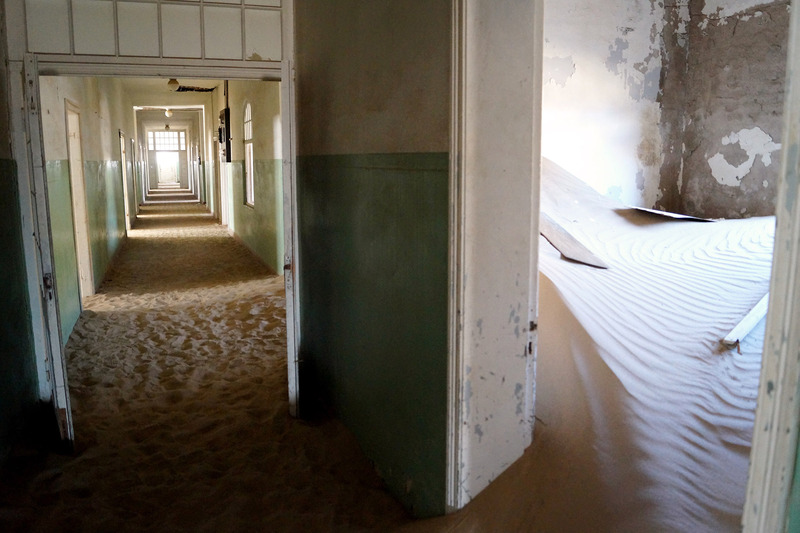 The Kolmanskop Hospital. The windows have not stood up to the force of the sand. Now a thick layer of it lies in each of the completely run-down rooms. Like many other buildings, the hospital is in constant danger of collapsing. 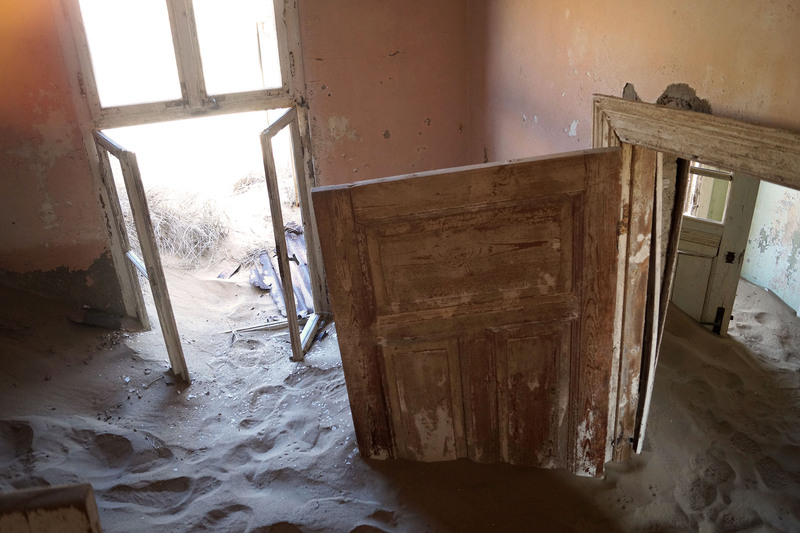 Incidentally, the last person lived in Kolmanskop until the 1960s. I wonder: Just what did he or she do for so long in this lonely region?! At any rate, the old settlement is a unique spectacle today. It not only takes you back to the time of the great diamond rush, but also illustrates the desperate attempt to permanently overcome nature. It reveals how close together rich and poor are, economic boom and decline, all and none  and yet, the barren Namib Desert has still not been stripped of all its diamonds. You just can’t find them on the ground anymore. 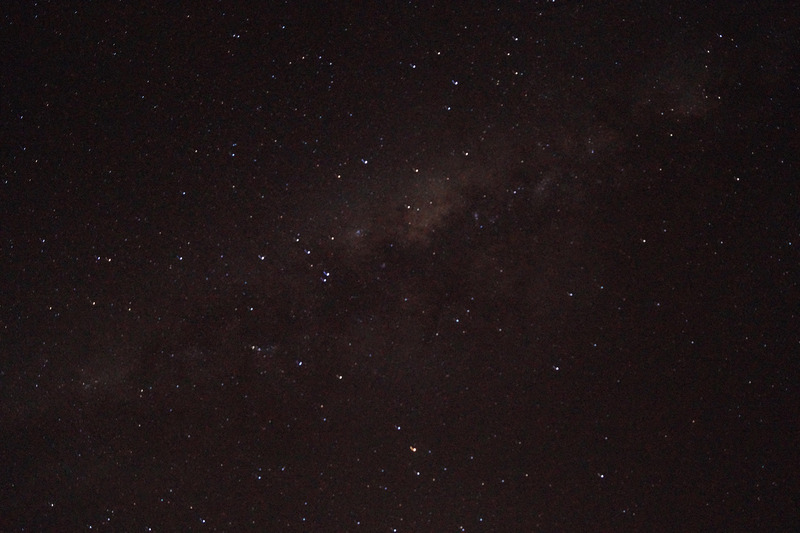 This is the first of a three-part Namibia story.